I have many beautiful memories of Thanksgiving. My mom, being one of the best cooks/bakers I know, always puts together the most amazing meal! She brings out the special recipes that we only enjoy during the holidays. Potato dumplings, almond crescents, and apricot kolaches were my most requested. All Czech recipes, passed down from my grandma. Maybe not the traditional things you see on Thanksgiving…but they are the ones that hold such special places in our hearts. Recipes to be thankful for! Even though it’s not a dessert that was passed down from grandma, pumpkin pie is my favorite thing on Thanksgiving! It’s really not Thanksgiving if there isn’t pumpkin pie. Am I right? I came up with a flavorful crust, using walnut meal. Flaky and the perfect pair to the pumpkin. The filling is also vegan and gluten free. No need for eggs! The sweetener of choice is pure maple syrup and the creaminess comes from our good friend, coconut milk. This pumpkin pie will not disappoint. I have many things to be thankful for this year. My precious family, encouraging friends, warm and cozy home, gracious church, and the unconditional love of my Savior. Hope you are able to reflect on the things, big or small, that bring joy to your life. Happy Thanksgiving, my gluten free friends! To make the crust, mix together the walnut meal, sorghum, potato starch, flaxseed, psyllium and salt in medium bowl. Cut in shortening using a pastry blender or fork, until it resembles a course meal. Add maple syrup and 1 tablespoon of water. Add more water if needed. Blend until moistened and form into a ball. Grease a 9-inch pie pan with extra shortening or cooking spray. Place dough onto large piece of plastic wrap and top with another piece of plastic wrap. Roll out into an 11-inch round with rolling pin. Remove plastic wrap from the top and place pie pan upside-down onto dough. Carefully flip the pie pan, along with the dough. Remove other piece of plastic wrap. Press down any cracks in dough and crimp the edges. Refrigerate for 1 hour or until ready to use. Preheat oven to 350 degrees. 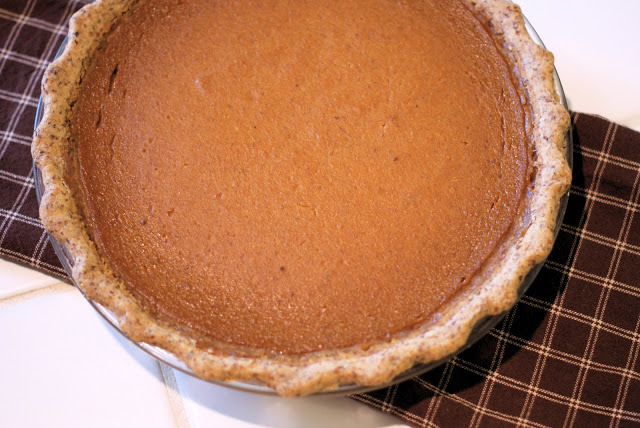 To make the pie filling, mix together the pumpkin puree, maple syrup, coconut milk, and vanilla extract. Add the cornstarch and spices. Whisk until smooth and well blended. Pour filling into pie crust. Bake for 50-55 minutes or until center is set. Allow to cool on cooling rack. 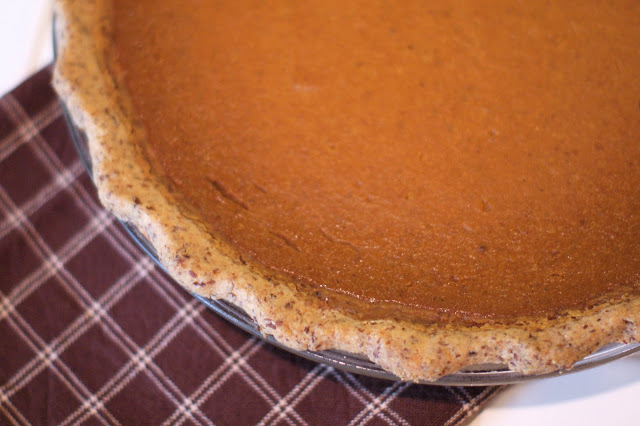 Refrigerate pie for 2 hours or overnight. It is not Thanksgiving without pumpkin pie. I'll be baking a gf vegan one to. Looks delish!! Can the crust from the Rustic Peach Pie be used for this too?? 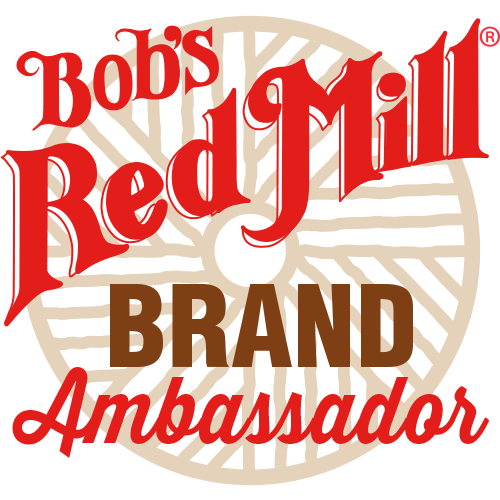 I use the Bob's Red Mill gluten free crust mix to save time, but this makes the absolute best pumpkin pie I have ever had. I made it twice last season and I'm making one today for Halloween. Thanks so much for this amazing recipe!! !